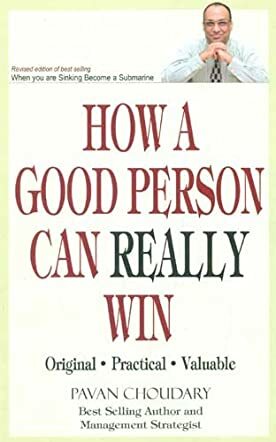 How a Good Person Can Really Win is an excellent book by Pavan Choudary on how strategy and values affect the successes and follies of people in the world of work and politics. The book characterises two types of people; the vile and the naive. The vile person operates on greed and ulterior motives, whereas the naive person is often unaware of the dangerous doings of the vile person and gets taken advantage of. In so doing, Choudary aims to expose these dual and opposing traits and illustrate how a predominantly vile person would act, for the benefit of the naive person, who he argues can increase his awareness and learn to build greater strength in his own principles and values. Choudary's style of writing is grounded, sincere and aphoristic. He illustrates his views with numerous stories, based on contemporary and historical people. Not only are the stories illustrative, but they serve to show that the concepts put forth are real and that vile patterns of behaviour repeatedly appear when morality is lacking. Part one covers the controlling and narcissistic machinations of the vile person, giving advice also to the vile person, and occasionally to the naive person, and sometimes to the independent ruler of both. Whether you consider yourself to be naive or not, part one is eye opening due to its thorough analysis of the numerous subtle and indirect ways in which vile people can manipulate and control others. It is clear from part one that he intends not only to expose vile tendencies, but to give vile people a chance to become self aware and to change for the better. In parts two and three, Choudary makes a strong attempt to uplift and empower the masses of good people who are struggling in complex power plays, and whose good efforts are thwarted or not duly recognised or rewarded. In all cases, the strong values are integral, but the external manifestation of them can sometimes be subtle and simple yet still effective in enforcing discipline and in encouraging reform. He suggests practical options for avoiding direct confrontation and achieving goals discreetly but effectively. Also, the importance of seeking wise advice and giving advice at the right moment without sermonising is explained effectively. Rather than adopt a formulaic approach to working with others, Choudary explains the importance of good timing in taking important decisions and being intuitive and adaptive. Furthermore, he advises masculine people to develop their feminine polarity, lead with a large heart, and allow talent to flourish in an organisation. Thus, he hopes to show people why they should avoid the pitfalls of ego, hatred, and jealousy, even when wronged. Nevertheless, the book does not compromise in the importance and benefit of strong principles and of good leadership and discipline. As Choudary says, “the good should make use of any adversity they come across.” This statement alone is abundantly substantiated in the book, and I believe everyone can learn more from life if they adopt this approach. I encourage people to thoroughly read How a Good Person Can Really Win and highlight the advice in it which they need most. Choudary is a visionary with deep insight into the workings of different types of people and, through this work, is trying to improve the efficiency, principles, productivity, fraternity and morality of organisations. He wishes to arm the good man with inspiration, creativity, motivation and practical advice in which to emerge victorious from unpleasant situations, such as direct or indirect attacks, being cheated or being undermined. Spiritual people will appreciate the value placed on prayer and recognition of one's place in the universe. Not only is the book relevant to contemporary corporate and political settings, but it has stories and quotations from philosophers, rulers and other important figures across the world, which make How a Good Person Can Really Win a cultural integrator and an informative catalyst.